COTONOU (Reuters) – Benin’s President Thomas Boni Yayi escaped unhurt after gunmen attacked his convoy as he returned from a parliamentary election campaign rally in the country’s north, a presidential adviser said on Friday. “The vehicle which was hit by the bullets was in the position which the head of state usually occupies. 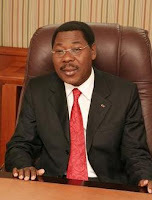 But this time he happened to have changed,” Didier Akplogan, communications adviser to Yayi, told Reuters by telephone. The attack happened late on Thursday at around dusk close to the town of Ouesse, some 240 km (150 miles) north of the West African country’s main port city, Cotonou. Yayi’s convoy turned back towards the north rather than carrying on to the capital after the attack, said Edgar Guidibi, head of communications for the FCBE alliance of political parties which support the president.